The roots of Osaka University can be traced back to the founding of Tekijuku, a place for study opened in 1838 by Koan Ogata, a medical doctor. 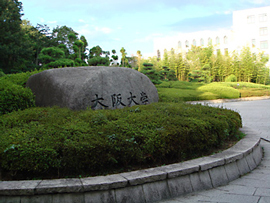 In 1931, Osaka Imperial University was established, which then comprised of a School of Medicine and School of Science. In 1933, the new Imperial University established a School of Engineering, having absorbed the nearby Osaka University of Engineering. Other Schools continued to be added to the University, such as the School of Engineering Science, founded in order to encourage comprehensive interdisciplinary exchange between the science and technology and academically positioned in between the Schools of Science and Engineering, and the School of Human Sciences, which encompasses disciplines such as psychology, sociology and education. 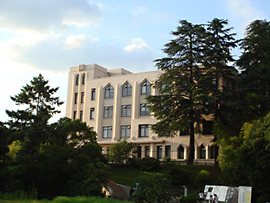 Thus Osaka University has a strong tradition of establishing unique and innovative fields of education and research, creating a precedent for many other universities in Japan. In 2007, Osaka University merged with Osaka University of Foreign Studies, and the School of Foreign Studies was established. To date, Osaka University and Tokyo University of Foreign Studies are the only two public national universities with specialist foreign studies departments. Osaka University is an integrated center for research and education that has pioneered new research disciplines, and is dedicated to tackling the many issues that we face today through education and research inspired by the University's motto: “Live locally, grow globally”. In the fields of medicine and biosciences, Osaka University has been at the forefront of organ transplant medicine in Japan, performing the very first heart transplant surgery in Japan (1999) after the new organ transplantation law came into force (1997). Japan's very first successful heart and lung combined transplant surgery was also carried out at the University in 2009, and it is the only institution in the whole of Japan able to carry out transplant surgery for any organ, from brain dead donors. The University also has a strong tradition in immunology research, boasts an impressive list of leading immunological researchers, such as Dr. Tadamitsu Kishimoto and Dr. Toshio Hirano who in 2009 became the first Japanese researchers ever to be awarded the Crafoord Prize from the Royal Swedish Academy of Sciences for their “pioneering work to isolate interleukins, determine their properties and explore their role in the onset of inflammatory diseases”, and Dr. Akira Shizuo, who in 2004 received the Robert Koch Prize and is renowned as the undisputed world expert in natural immunity. Today, pioneering interdisciplinary research is being carried out at the University, in dedicated research units such as the Immunology Frontier Research Center and the Graduate School of Frontier Biosciences, which brings together the disciplines of biology, medicine, brain science, physics and engineering into an integrated whole. Osaka University has also been a prominent center of research in quantum physics since very early on, building up an impressive resume of significant findings. The first President of Osaka Imperial University was Hantaro Nagaoka, a physicist with an important record of achievement in research, including the proposal of the Saturnian model of the atom. In 1949, Dr. Hideki Yukawa, received the Nobel Prize in Physics for his work on Meson theory, much of which had been conducted while he was working as an assistant professor at Osaka University. The tradition of outstanding research in physics in Japan can be traced back through Nobel laureates such as Hideki Yukawa and Shinichiro Tomonaga, to Yoshio Nishina, all the way back to Osaka University's Hantaro Nagaoka, who is the grandfather of modern physics in Japan. Osaka University is also home to dynamic and diverse activities in engineering research, encompassing such disciplines as materials science, robotics and photonics. The School of Engineering began life as Osaka University of Engineering, which was established at the end of the 19th century in response to strong demand from local industry, which was undergoing rapid developments in commerce and industry. Once founded, the School of Engineering continued to respond to the demands of industry and to anticipate potential future developments and applications, establishing new courses, unavailable elsewhere in Japan, in precision engineering, telecommunications and welding, thereby creating the basis for the modern School and Graduate School of Engineering in place today. Close contact with local industry has also been carefully maintained and nurtured over the years, and today the University works with businesses to offer joint research programs as a new framework for university-industry collaboration. The Graduate School of Engineering and the Center for Advanced Science and Innovation are principally responsible for building upon engineering research at the University and translating findings into applications that will make a difference to the local and wider communities. In 2009, Osaka University was selected to take part in the Global 30 Project for Establishing Core Universities for Internationalization, run by Japan's Ministry of Education, Culture, Sports, Science and Technology. As part of the project, Osaka University will increase the number of degree courses taught exclusively in English, and will enhance its short-term international study programs. It is also taking steps designed to double in the next decade the number of international students studying at the University to 3,000. Written on Nov 22, 2010. Added on Aug 2, 2011. Akio Morita was one of the co-founders of Sony Corporation, together with Masaru Ibuka. In 1944, he received a bachelor's degree in physics from the School of Science, Osaka Imperial University. Osamu Tezuka was a pioneering manga artist and animator who also held a doctoral degree in medicine. He graduated from the School of Medicine, Osaka Imperial University, in 1951. He is best known for such works as Astro Boy (1952) and Kimba the White Lion(1950). Hidesaburo Hanafusa was the world's leading authority in cancer genetics research. He established the basic concept of how cancer occurs; genetic mutation causes abnormalities in cells. He received his bachelor's degree from the School of Science, Osaka University, 1953. In 1982, he became the first Japanese ever to receive the Albert Lasker Basic Medical Research Award. Tadamitsu Kishimoto is a world authority in immunology who also discovered the protein IL-6. He graduated from the School of Medicine, Osaka University, in 1964. In 1997 he became President of Osaka University. A world-leading authority in immunology and currently a Professor at Osaka University. He is particularly noted for his breakthrough work on Toll-like receptors (TLRs), of which there are 12. He had demonstrated which pathogenic agents are recognized by which TLRs, work for which he was awarded the Robert Koch Prize (2004). He is also the recipient of numerous other international scientific and academic awards. He has helped to build the foundation of basic research in innate immunity. He placed in the top ten of the Thomson Reuters “Hottest” Researcher list for four years running from 2005 onwards. He continues to attract worldwide interest in his ground-breaking research.